HEAVY SA – A showcase of South Australian Heavy Metal! WIN $50 AT THE BAR!!! All ticket and promotional merch bundle purchases from us go into the draw to win $50 cash drinking money on the day! Winner drawn and notified the day before the event. Cash prize available at the event only. Other discounted merchandise/ticket bundles available from our store at the link above. South Australian Metal rules! Since the dawn of the heavy metal movement, South Australia has consistently produced heavy bands of the highest calibre, often sitting among the very best at the forefront of their respective sub-genres of metal. It is no different today, with many talented local bands developing loyal followings amongst the rabid metal masses by touring their arses off nationally and internationally, and releasing world-class albums that can match it with the best of them. On May 7th 2016, HEAVY S.A. will showcase 18 of these home-grown heavy metal heroes, assembling on one stage to show you why S.A. METAL RULES!! Tickets are available at our online store or at the door for $15, and have been kept at a very affordable price so everyone can enjoy the metal mayhem. 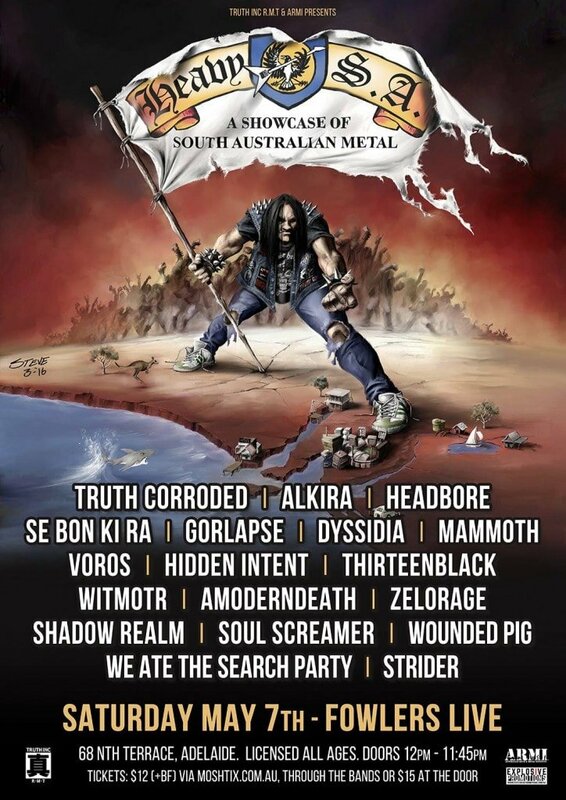 Spread the word, share the event, support South Australian METAL and let’s make it a huge HEAVY S.A. metal party!!! RAISE YOUR HORNS FOR YOUR HOMEGROWN!! RAISE YOUR HORNS FOR S.A METAL!! !